THIS volume treats of no common man and no ordinary times. A recent writer says: “The story of the times in which the Swiss Reformation was wrought, is surrounded with a sublimity, romantic grandeur and interest that attach to no part of the great German movement under Luther.” Part of this story is told in Dr. Merle D’Aubigne’s “History of the Reformation of the Sixteenth Century;” it will be more fully related when, with the good hand of God upon him, he completes the “History of the Reformation in Europe in the time of Calvin.” Here and there, through these Histories, are glimpses and pictures of a man whose life was second to that of no other reformer in brave adventure and heroic deeds. In it was gathered most of the romantic daring and endurance of the Swiss Reform. This man was William Farel. Michelet calls him “the Bayard of the battles of God.” He was the forerunner of John Calvin, who called him the “father of the church at Geneva.” Enemies honoured him with the title of the “Valais Luther,” even before he had entered upon the noblest part of his career. We cannot refrain from calling him the Elijah of the Alps. So important and instructive were his labours and character, so intense his devotion to God, and so sublime his earnestness of purpose, of preaching and of prayer, that immediately after his death, his intimate friends took steps to secure a record of his life. Since then it has been written several times by Europeans, but such works are either not translated, or they are not readily obtained in this country. To supply their want is the design of the present effort. The author cannot com-plain, as Calvin once did, of “a forest of materials,” for he is not writing in an Old European Library where the original documents are stored, and yet there is at hand much material which he has not used. If it be thought that the author has done little more than copy and re-arrange the pictures found in D’Aubigne’s Histories, he will be content. 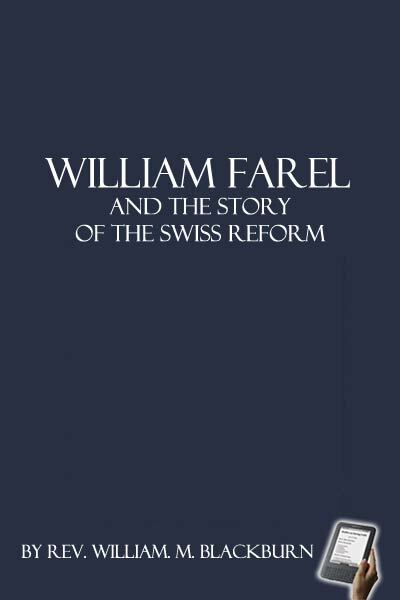 The other works consulted are chiefly these: The “Swiss Reformer, or a Life of William Farel, from the German of Melchior Kirchhofer” (abridged); “Life of John Calvin, by T. H. Dyer;” “Life and Times of Calvin, by Paul Henry, D. D.;” “·Wilhelm Farel und Peter Viret, von Dr. C. Schmidt.” “Letters of John Calvin, compiled by Dr. Jules Bonnet.” These four volumes of Letters are a monument to the enterprise of the Presbyterian Board of Publication,which has the praise of first publishing the entire collection in an English translation. CHAPTER 1. THE HOLY CROSS.